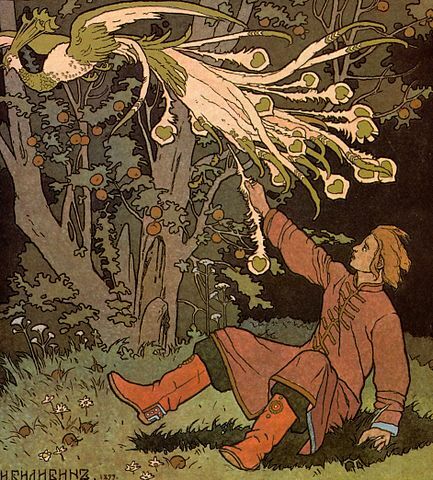 In this Russian Fairy Tale from the same collections as the stories of Koschei the Deathless, we find a prince who goes on a quest for the firebird. This leads us into a Russian nesting quest situation, where he ends up on a quest-within-a-quest-within-a-quest. We'll also follow his doofus brothers, who decide that taking an extended camping trip getting drunk in their silk party tents is much better than questing. On the creature of the week, it's a large horse-headed monster who will push you down or trample you...all while giggling like a child. Started listening to this show via Spotify. Great way to listen to the show during travels. Great speaking voice, humor and seriousness balanced perfectly. Will definitely make sure to listen to all 100+ episodes and hope all will come available on Spotify. Heh. I’ve always loved this story because of how truly idiotic Ivan is. The version that I grew up with didn’t include any reason for grabbing the cage and bridle other than “ooh, shiny!” and included a bit where the wolf warns Ivan that if he tells his brothers what happened then they will kill him. Guess what he does! Do you post bibliographies for each podcast? I should, and I’m planning on it. It’s one of those things where I didn’t do it in the beginning, and I just continued not doing it. I’m getting more and more people wanting to read the stories now, though. I’ll probably start and work my way back. Does the wolf in this story have a name? Or is it just called the wolf?